What happens when spirituality, science and pop culture combine forces in the universe? A little magic is made. The Moon Lab is a unique Etsy shop with a style and flair all its own. 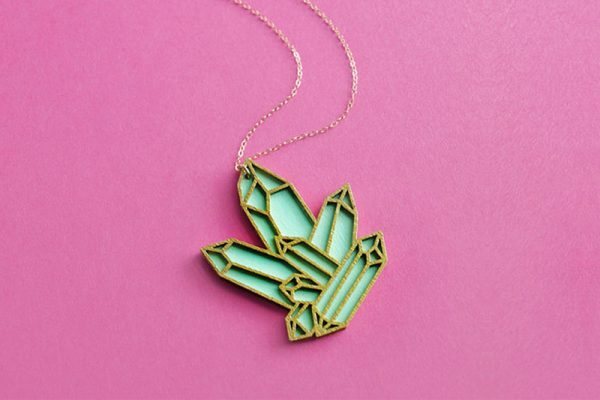 “When starting with jewelry design, my challenge (and also my desire) was trying to create pieces that I personally had always wanted; things that don’t exist; things you can’t find anywhere,” founder Aeryn explains. And she has succeeded at creating a collection of stainless steel pieces that have become her signature style. What’s interesting: Stainless steel wasn’t her first material of choice. A graphic artist living in Burbank, California, Aeryn says her Etsy shop has an eclectic mix of themes unified by consistent design aesthetic. The inventory rotates because the things she loves varies so much, but right now the collection features a little bit of spirituality, science, old school gaming, movies and anime. 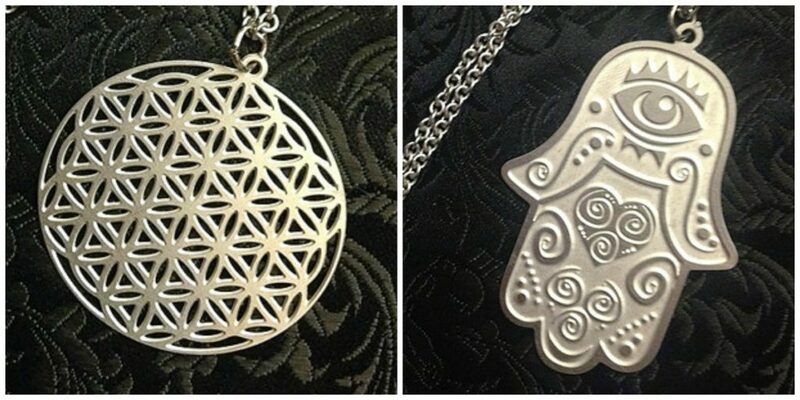 You can see her spiritual side in the Flower Of Life (left) and the Hamsa (right) necklaces. The Flower Of Life is a geometrical shape composed of multiple evenly-spaced, overlapping circles arranged in a flower like pattern with six fold symmetry like a hexagon. According to Token Rock, the perfect form, proportion and harmony of the FOL has been known to philosophers, architects and artist around the world. The Hamsa—a symbol of an eye embedded in the palm of an open hand—has been variously interpreted by scholars as a Jewish, Christian or Islamic amulet, according to My Jewish Learning, and its magical form continues to be shrouded in mystery. Science is another theme Aeryn explores, and there’s no shortage of inspiration. She recently added three new pieces to the collection to pay tribute to the works of Albert Einstein, Nikola Tesla and Carl Sagan. She has also tapped into some scientific symbols that serious mathematicians, chemists and fans of The Big Bang Theory will fall in love with. Pi, the ratio of the circumference of a circle to its diameter, seems a simple enough concept. But as Live Science explains, it turns out to be an “irrational number,” meaning its exact value is inherently unknowable. Wearing 3.14 around your neck sounds like the ultimate expression of number love. For even more fun, Aeryn says to make sure you wear the necklace on March 14th while eating pie. Or wear it backwards because, coincidentally, it spells PIE! 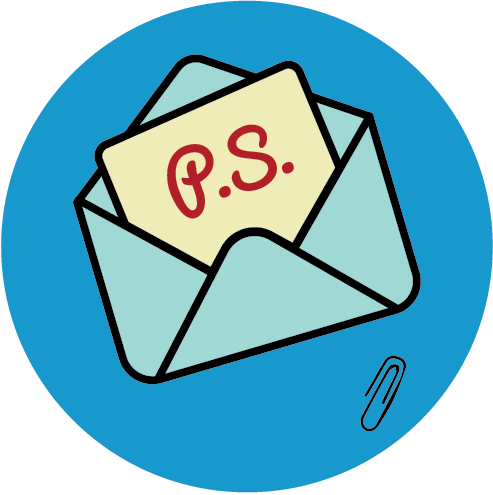 If that doesn’t make you smile, then perhaps you need more serotonin—the molecule associated with making you feel good—in your life. If you’re feeling a little down, this necklace (middle) that details the molecular structure of serotonin will certainly cheer you up. Alchemy, the precursor to today’s chemistry, is a medieval chemical science and speculative philosophy that aims to achieve the transmutation of the base metals into gold, the discovery of a universal cure for disease and the discovery of a means of indefinitely prolonging life. 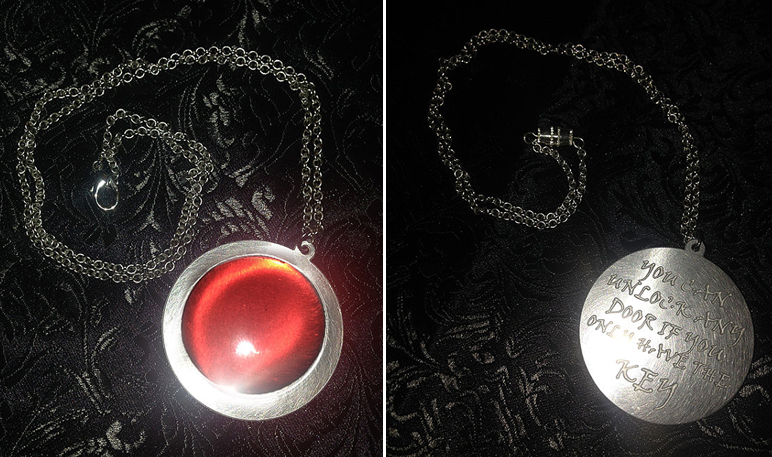 Perhaps wearing this necklace (right) will begin the process of transforming something common into something special. 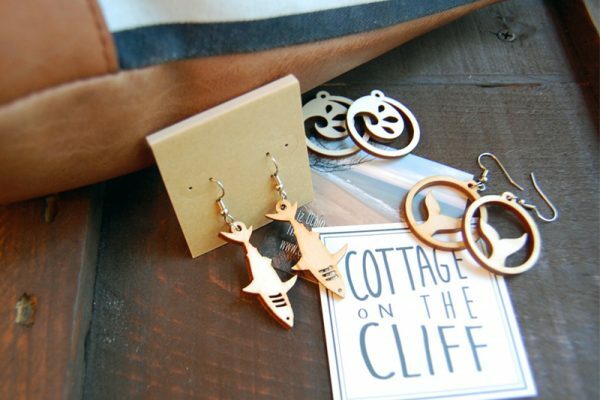 The worlds of gaming and anime are full of characters that are ideal for being turned into jewelry pieces for fans, and Aeryn has tapped into this appeal to add a whimsical element to her collection. For Final Fantasy fans, the Cait Sith (middle)—everyone’s favorite moogle-riding, crown wearing cat—is a must-have accessory. Kodama—spirits in Japanese folklore that inhabit trees—are “the cutest characters from Princess Mononoke,” according to Aeryn. They are signs that a forest is healthy, so wear it in good health. Aeryn has created a lot of original designs as well as ones inspired by movies or TV shows she loves. But her favorite piece is something she has wanted ever since she was a little girl: A necklace inspired by the film The Secret of NIMH.